Samsung has truly gained back its momentum with the launch of its new Galaxy S8 smartphone. Even display analyst DisplayMate recognized the effort and named its Infinity Display the best smartphone display out there. 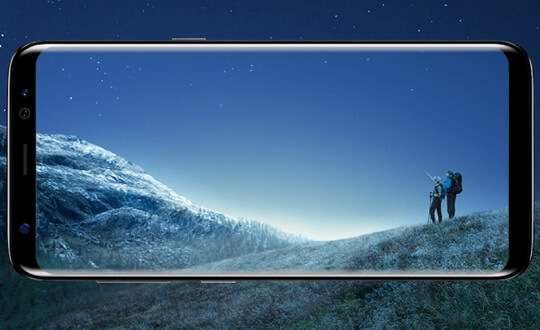 With an A+ grade, the highest grade that DisplayMate Technologies has ever given to a smartphone's display, the Galaxy S8 just proved that it is indeed a genuinely remarkable innovation from Samsung. Dr. Raymond M. Soneira, the President of DisplayMate Technologies Corporation, published the lab results himself. According to him, the Galaxy S8 is "the most innovative and high-performance smartphone display" that they have ever lab tested. The Samsung Galaxy S8 sports a 5.8-inch Super AMOLED Infinity Display with close to 3K resolution and a new 18.5:9 aspect ratio, protected by Corning's Gorilla Glass 5. 1. Higher Screen Brightness from 5% to 19%. It can reach a Peak Brightness of over 1,000 nits. 2. Larger Native Color Gamut with 113% DCI-P3 for better-displayed Colors in High Ambient Light. 3. Absolute Color Accuracy and Viewing Angle performance. 4. Enhanced configurable Edge Display for the curved side screens, Always On Display mode operated with IC hardware rather than App software, Personalized Auto Brightness Control, Image Processor for Adaptive Dynamic Brightness and Contrast Range Expansion, and Performance Modes and Power Saving Modes. 5. Stronger curved Gorilla Glass 5 protecting the display. If you want to be one of the firsts to get a hold of the new Samsung Galaxy S8, go ahead and mark your calendar now. The pre-order starts from April 17 to April 29, with a price tag of Php39,990. You can also have the S+ variant at Php45,990.